There were a few different women from around the locality who supplied Maggie with fresh eggs. I remember we would have to wash the eggs and clean them off to make sure they were perfect for displaying. Sometimes Maggie would give the women a certain amount of groceries in exchange for the eggs. Nora Davin in Curragh used to sell homemade butter to Maggie. I can still vividly remember the mioscán of butter (two to three pounds weight) which used to be so clear we could see the pure water coming out of it. Nora would have it protected inside the paper with a few cabbage leaves. Maggie would put a cover over it and sell it off by the pound or half pound. Lydon-O’Neills bakery in Clifden delivered fresh bread to Maggie every day. The most popular loaf was the buillín, a small white batch. Sliced pan was unheard of in those days. 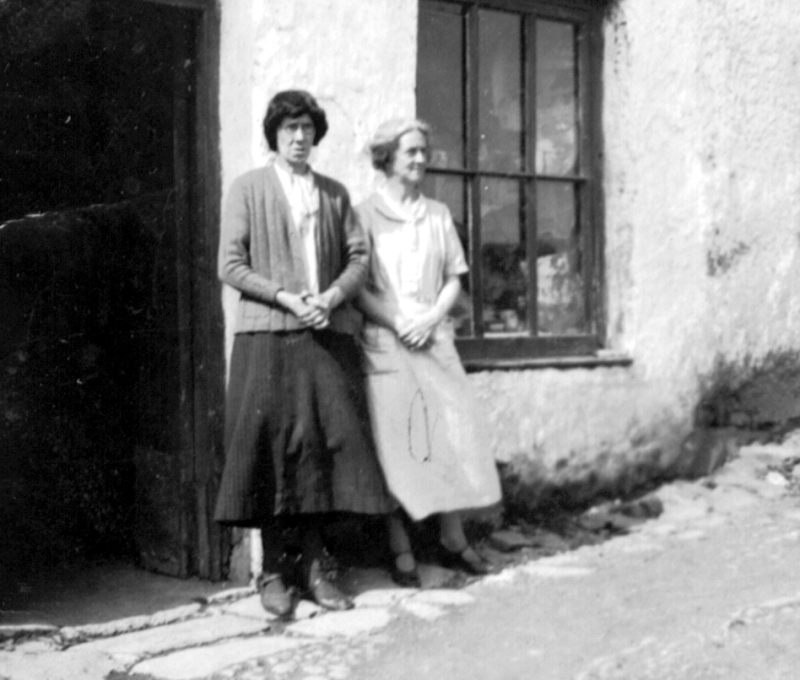 Maggie Flaherty with a tourist, outside her shop in Tully during the 1940’s. People could purchase paraffin oil in Maggie’s. She had a sixty gallon tank in the shop, which she was careful to conceal as much as possible with cardboard boxes. She used to charge sixpence for a gallon of oil and nobody except herself would fill the oil for fear of wastage. Maggie was the first of the local shopkeepers to order newspapers. She always told me that she got her first ever Irish Independent for Mr Coyne, the principal teacher in Eagles Nest National School in Renvyle. He was the first customer who directed her to order a newspaper. She also used to get the Irish Press. The papers used to arrive in the postcar, an old Ford Lincoln, driven by Mickey Mullen. As far as I can recall it was only the well-off who bought papers in those days. The ordinary working man had not time for reading them. Maggie always had a well stocked drapery section in her shop. She had worked, as a domestic in America and in the process had also become a very skilled seamstress. Hughes in Westport was her main supplier. Every two months a sales representative would visit her with all the new samples and Maggie would pick out whatever she wanted. A couple of parcels would duly arrive a few days later. Maggie used to make curtains for many different people. She often made beautiful lace curtains for station masses. She also made blouses for women. She would sell them the material first and them make the item. I remember she sold creton, a fabric for covering chairs. She also stocked a material called union, which was used for lining coffins. She ordered her towels and tea cloths by post from the Belfast Linen Company. She also sold underwear, shirts and beautiful homespun woollen socks for men. A Mrs Conway from Lettergesh supplied her with the homespun woollen socks. She always stocked tips for shoes, rubber heels, rivets and upper leather as well as leather for soling shoes. This leather was sold in twelve inch squares. I first got to know Maggie during the 1930s when I was still attending primary school. I used to go to the shop after school to see if Maggie needed any help. I was never classed as a shop assistant. Maggie never advertised for an assistant. She was bright and alert and did everything herself and even though her shop had a somewhat disorganised look about it Maggie always knew exactly where everything was located.